In the People for the Ethical Treatment of Animal’s nationwide game of Whack-a-Mole (the organization would probably object to calling it Whack-a-Mole because of its implied violence against the burrowing mammal), it has been fighting against the controversial delicacy foie gras. The group has battled in the courts to get it banned, gone straight to restaurants to get them to stop serving it of their own volition, and now they’ve worked with the meal delivery service Postmates to discontinue allowing foie gras orders to go through on its platform. PETA reached out to Postmates to discuss the issue and found a receptive audience, according to a representative with the delivery service. Postmates was already a company embracing some of PETA’s values, hosting a meatless Monday each week at their offices to highlight food from vegetarian and vegan restaurants. And within the last year the company has created a policy team that works on regulatory issues in the various locales they operate, while also performing community outreach and considering ethical issues in relation to food. But foie gras wasn’t the only issue the animal-rights organization and the delivery company had discussed in recent weeks. 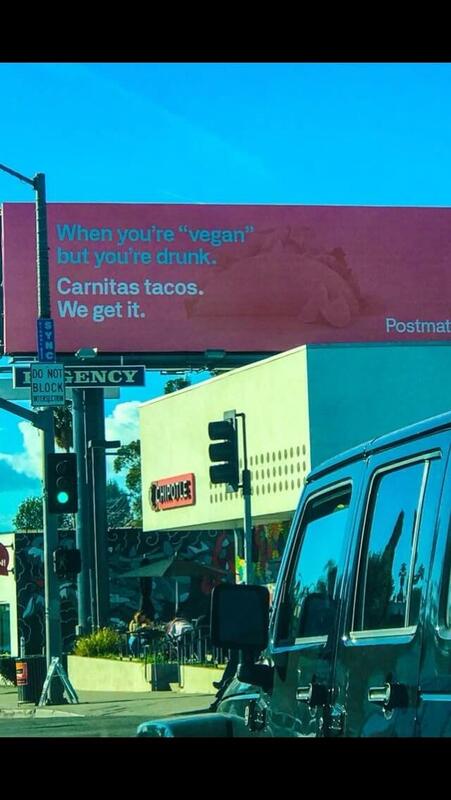 PETA has also convinced Postmates to take down a pair of billboards it had put up in LA. The organization wrote on its blog, “It was intended to be humorous, but as vegans know, eating according to your conscience isn’t a fad diet and doesn’t involve cheat days.” Of course, it seems PETA didn’t actually get that the joke isn’t on real vegans. It’s on that “vegan” friend we all have who proudly announces it as a way to signal their virtue, but then some delicious carnitas shows up and they suspend their values for a half hour. Whether PETA likes it or not, we all have a person like that in our lives.